After running the Ubuntu Translation Teams Healthcheck I took it to heart to help translation teams in the areas they asked for assistance in the survey. "We don't get much feedback, to be exact, we need to beg the users for feedback, once in every few months someone is kind enough to tell us that there is a translation mistake [...]"
In short, the team needs your feedback. Whether it is to tell them there are translations that need improvement, or whether it is simply to commend or support them in the awesome work they do translating Ubuntu, they'll be very happy to hear from you. So, do you use Ubuntu in Hebrew? Do you want to help? There are many different ways you can support Ubuntu in your language. Pick one or more of them! 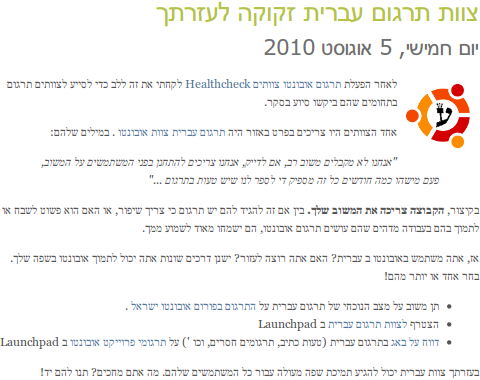 Give feedback on the current state of Hebrew translations on the Ubuntu Israel translation forum. With your help the Hebrew team can reach excellent language support for all their users. What are you waiting for? Give them a hand!